I am wondering if there is a way that UFO Analyzer measures the uncertainty of the meteor's path. If there is, how can I find out what it is for each meteor? UA2 measures uncertainty values below. 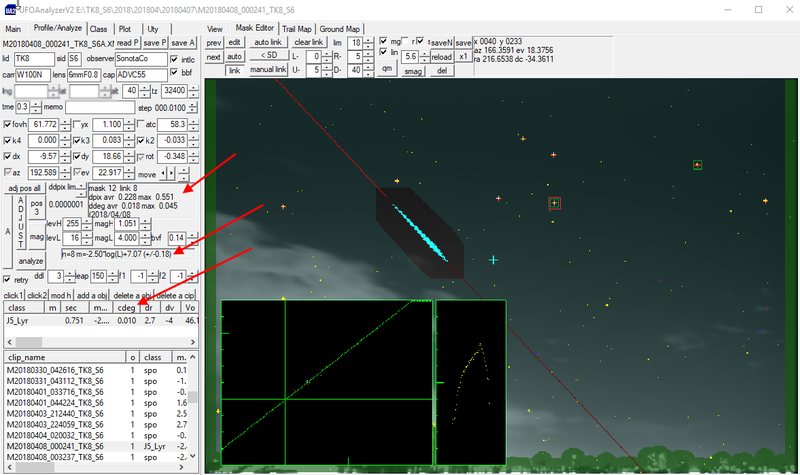 FOV plate adjustment error (ddeg: average direction error (degree) of ref stars). Meteor trajectory linearity error(cceg: residual of least square err on straight line fitting(degree)). cdeg = 0.010 degree for 46 (=0.751*59.94 + 1) fields. Our uncertainty computation method is under improvement. Please refer below and its references. Thank You for the information about the uncertainty! I am now having a different issue with UFO Analyzer. I am not able to make any blue points of the scintillation mask appear on the Mask Editor screen. There are many stars visible in the frame, and the reference stars are overlapped near perfectly with them. Some time ago I was able to match 48 reference stars to stars on the scintillation mask. I saved that profile and am trying to use it with newer videos, but no matter what I press, I see no blue stars. Please let me know if you know a solution to this problem. I can send you pictures of my screen if that would help. To discuss about problems, please describe your system first. Lens, cam, capture hardware, resolution, fps... are you observing meteors? Generally blue dot problem is not setting of UA2, but UFOCapture. You can see the scintillation mask by Preview option MaskW ON while you see the stars in the live video. There, tune SMlevel properly to see appropriate number of white marks.